My early childhood was spent living in Chubbuck, Idaho. A small suburb attached to Pocatello, Idaho, about 40 minutes south of where I reside now in Idaho Falls, Idaho. Now if you were to ask anyone here at The Group Real Estate what it truly is that sets me a part from other people, you would probably here a few of the same comments, whether its from, Bodybuilding to being a movie snob to collecting comic books. However, one silly thing that truly sets me a part is my uber love for The Mighty Morphin Power Rangers. Now, I grew up with them, in the early 90s. This was a show I would watch religiously, I loved the fun moments, the fight scenes, the martial arts, the “Transformers” feel, the theme song, the silly comedy, the over the top monsters, all of it! 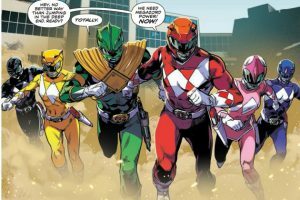 One thing that set Power Rangers above the rest of what we watched as kids was the fact that it always had some moral story with it, or notion to make you want to be better. This sounds cliche, but bare with me on this. Back in the 90s, the way we went to school was very clique like. There were the jocks, the nerds, the pretty girls, the band geeks, etc and so many more. 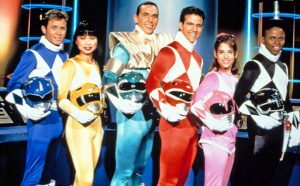 Power Rangers taught us, first and foremost, that it was okay to be friends with anyone, no matter their talents or likes. One of the reasons that I love Power Rangers to this day, is knowing even more the back story of how they put this TV show together. At the time there was a Japanese show going, called Super Sentai. 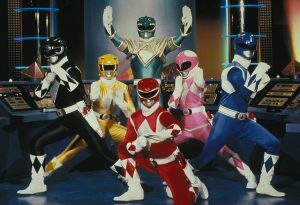 This is where our American version of the Power Rangers came from. As Super Sentai had been going on for a few years, a man named Saban, reached out to the Japanese company who created Super Sentai, asking to use the characters and the footage for his American show. He went on to hire a few teenage, and some older, actors to play these “teenagers with attitude.” Now, if you read accounts from these actors, it wasn’t a walk in the park or even that great being a part of the Power Rangers phenomena, at the time. They were working 7 days a week, to do their own stunts, to make sure that they filmed all they needed to for the upcoming episode that week, and they did the voice over work when it was the Super Sentai footage. If they saw that there was a weird transition from one part of the original footage, they would also have to suit up in the Ranger costumes to film those transition pieces. As a kid, none of this was noticeable. But man is it great to watch now, knowing all that they did, and went through. A few of the fun things to watch out for now, are these things. The Green Ranger was a villain in Super Sentai. And for his first run, here in America, he was as well. However, the character of Tommy was then turned good, and became a good guy. Saban reached out to the Japanese producers and told them how popular Tommy had become, and if they would be willing to bring the character back, as a good guy, so he could use that footage, as he had been with the other Rangers. When they agreed, this is where it is interesting for our version. As they were generating footage in Japan, Saban had already brought Tommy in as a regular. But we get a lot of episodes where they had to find some reason why Tommy couldn’t become a Ranger for awhile, as there wasn’t a created version in Japan yet. Another great one, is the Yellow Ranger in the Super Sentai is played by a man. In Power Ranger, the Yellow Ranger is a girl. So, now, as I am older, you can definitely see the differences. The transition stuff is great to notice, as well. When you see the difference in how pristine the Super Sentai suits look, to the way they look in Power Rangers, as they didn’t have a lot of money to work with in the American version. Some of these are so great to watch out for, now knowing what went on, how it was created, and the things these poor actors went through. Including some of them leaving the show, as they were making around $6 an hour, is all, with the hours they put in, how they were working, the way they were treated, etc. So, at the time of their departure, they would use old stock footage to bridge the gaps in some of the shows before they were able to get new actors. Power Ranger mania is still very alive today. There are a lot of very loyal fans out there to this day, just like me, who love to watch the episodes with their kids, talk about the exciting fight scenes, and mostly discuss the merits that the show brings. As my wife hates it, due to how silly and dumb it is, which I totally agree with, I love that every single episode has some sort of very positive message to share with my kids. The training in martial arts and sports that the actors had, lends itself to some really cool action scenes for a cheap, 90s, kids show. And they make sure to let the audience know the importance of competition, martial arts, and why learning discipline is so important. The idea that there is still a show, that has been going since the early 90s, is impressive. Very few shows have been able to do this. We have shows such as the Simpsons and Family Guy, but for a kids show about kids who have powers, is super silly, but keeps it up, is a feat to behold. There are still Power Rangers shows being made to this day. The phenomena is still so alive that there is a brand new movie, based on the tv show characters from the 90s and a comic book, of the same characters, that has been going for about five years now. Do yourself, even if you didn’t watch the show growing up, and check out the original Mighty Morphin Power Rangers. It has a wonderful charm about it. It shows us some fun Japanese monsters that only the country who gave us Godzilla and anime could muster up. There are wonderful ideas and stories to be told, as well. They are very family friendly, and if you have kids, they will love it just as much as you do, if not more. And the theme song may just become your new favorite, albeit annoying, ringtone very soon!